I’m sure everyone who reads this blog has noticed, at some point, the result of another developer’s mistake in dealing with Unicode or other character encodings. I’ve had a few issues myself. To the left, you can see how my Napster displayed a Beyoncé song as Beyonc□. You may have seen a black diamond symbol with a question mark in it while browsing a web page, or perhaps other strange symbols when interacting with programs or web pages. My issues have been even more low-level than this. I deal with a lot of interaction using EDI with older computer systems running UNIX or or some IBM mainframe OS. None of these are using Unicode for their medical claims adjudication, and are either using ASCII or EBCDIC. Yes, EBCDIC; I have to program using EBCDIC in 2009. 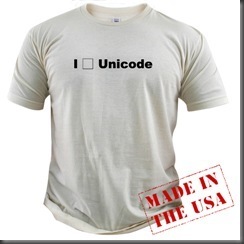 I have to be very careful when I’m converting to and from Unicode, the native format of the string class in .Net, and other character encodings such as ASCII and EBCDIC, and so should you. A coworker of mine had a problem and came to me for help. She had a windows form with a control on it that she wanted to edit or delete, but couldn’t see the control. It was listed in the properties box in the list of controls on the form, but when she selected it, she wasn’t able to click it on the form, because it was behind another control. I hypothesized a solution, which worked, but requires the use of a less than frequent key on your keyboard, the menu key. 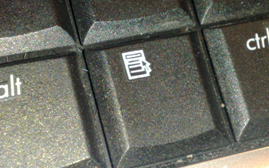 Usually this key is two keys to the right of the space bar on windows keyboards, between Alt and Control. A picture of it is on the right. Note: As pointed out by Lee, in the comments, you can press Shift + F10 if your keyboard doesn’t contain the Menu Key. Select the control that you can’t see. It will be highlighted on the form. The hidden control becomes highlighted. Click into the title bar of the form. 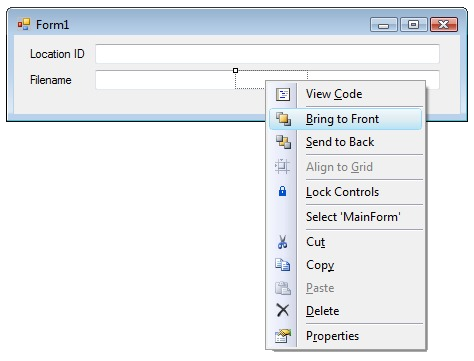 Press the menu key on your keyboard to display the context menu. Select “Bring to Front” to display the control. It will now be visible and can be edited or removed. As you can see, the control that was previously hidden is now visible and has been moved. I know this is a basic solution to an easy problem, but I had to figure it out, and I hope that someone searching may find this useful as well. The above example was a new form I was starting; it is not the actual application in question. While taking a break from disco dancing, I was trying to add a strong name to one of our projects. One of the requirements, however, for strong naming is that all of the assemblies you reference must be strong named as well. All are, except one: COMM-DRV/Lib.Net. We use this assembly to talk to the modems, because it abstracts a lot of the serial communications and allows us to program against a logical “modem”. I called the vendor, Willies Computer Software Company, and he said that we’d have to have the source license to strong name, but I asked why they don’t strong name their own binary distribution. He just kept saying they don’t do that, and we’d have to buy the source license. We didn’t need to make changes to their code, though; in fact, I already did that by inheriting their class and hiding some methods with new ones. So, I set about trying to find out how to strong name an assembly for which you do not have the source. The short answer is “you can’t.” The longer answer is “You can’t, unless you disassemble it, reassemble it, while signing at the same time, and only if it’s not obfuscated.” I finally found the answer I was looking for at geekzilla. This is only necessary, of course, if you don’t already have one generated for yourself or your company. Thankfully, everything worked great, because their assembly was not obfuscated (it’s basically a .Net wrapper around their C++ unmanaged, native DLL product, so no real intellectual property to steal here). Now, we have their product strong named with our public key, and we are able to build on top of it with a strong named product of our own. Update: Added section at the bottom detailing what not to do. As part of the updater process that I wrote for a current project, a “boot strapper” program queries the database for available versions, and if there is a newer version available, it deletes the current program folder, replaces those files with the new files, and then executes the main program executable. If there are no newer versions, it simply executes the main program executable immediately. This gives the user they are executing the program itself, instead of the “invisible” boot strapper, but we are able to easily manage updates in this manner. /// Extensions of files that may be deleted during uninstall/reinstall. 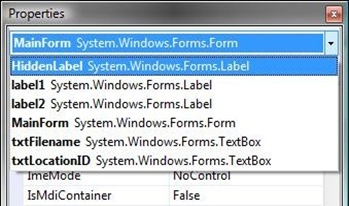 // Only delete files with specific extensions. Before anybody murders me, we camel case private methods and underscore prefix and camel case private class-level variables here. As you can see, this will allow deletion of executables, class libraries, debug symbols, help files, and manifests. However, we had a problem in my code that didn’t surface until yesterday. We were trying to figure out why one file out of all the files in the directory was remaining an older version, “ActiveReports3.DLL”. What may be obvious to the reader, especially considering the title of this post, is that my List<T>.Contains() check, by default, is case sensitive, and “.DLL” != “.dll”. This required quite a bit of stepping through code to find, as I wrote this code a long time ago. A simple press of “Ctrl+Shift+Space” revealed that there was an overload of IEnumerable<T>.Contains(T item, IEqualityComparer<T> comparer). That’s it! That tiny change fixed our issue and allowed the boot strapper to overwrite that file. It’s amazing that a simple little omission like that can lead to such a strange problem manifesting itself. Everybody makes mistakes; I just thought I’d showcase one of my errors and how I fixed it. This creates a LOT of strings on the heap in the process is and is very inefficient. It’s much better to let .Net handle itself and just let it know whether you care about culture and/or case sensitivity.